It all began with the 2011 Hollywood film Moneyball detailing to how the Oakland Athletics General Manager Billy Beane used Big Data analytics to assess the performance of players when selecting baseball teams to improve the future of his Oakland Athletics in Major League Baseball. Billy Beane used predictive modelling and a statistical approach -to overcome salary cap constraints and predict the future performance trends in baseball. Despite the fact that the film did not have a happy ending as the Oakland A’s were eliminated before the finals to the World Series, Moneyball highlights the big role played by Big Data in Sports analytics. Can an analytics algorithm help in building a strong baseball team? Can an analytics algorithm help basketball teams play better defense? Can an analytics algorithm tell a player if the next game pitch will be a slider or a curveball? The answer to all the above questions is a big YES with various sport associations already leveraging big data analytics to have an edge over the competing teams. “Sports are watched by millions and millions of people – yet, pretty much all of the strategic decisions are made by humans in a split second. These decisions could definitely be enhanced by learning from past data, but humans can’t keep large databases in their heads. Thus, predictive analytics tools will help teams make these decisions. If we know, for instance, that in certain circumstances, a particular coach on the opposition team tends to make a particular decision, then we can be ready for it. We can place sensors all over a car while it is in training for a race, and use the sensor data to help a driver learn how to race better.”- said Cynthia Rudin, associate professor of statistics at MIT. High-powered big data analytics algorithms and high-definition CCTV cameras are replacing human scouts and statisticians helping coaches to have a competitive edge in predicting about the performance of a player and the outcomes of the game. The analytics algorithms analyse and predict the outcome of a player or game by reviewing the historical data, reviewing the video and images of a player’s activity and various other data points. English Premier Leagues’ Arsenal is spending big on big data analytics. Arsenal installed a set of 8 video cameras in their stadium for tracking ten data points every second per player totalling up to 1.4 million data points per game. The big data generated is then analysed with the help of automated tools and analytics algorithms to discover playing patterns that players or coaches might miss on. Arsenal can now identify “off the ball” events. 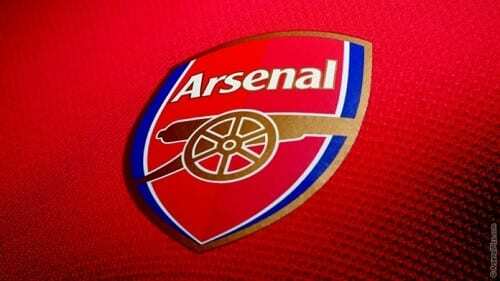 Arsenal is improving its team by fine-tuning the player’s movement and positioning on the field. “In many ways, sports is the perfect testing ground for “big data” and predictive analytics technologies. It’s a closed system; sports have well-defined rules, and we know the outcomes we are looking for. So if we can provide enough data points, then fundamentally, we can reduce sport to a classic computer science problem of analysing data for trends.”- said Tony Baer, data analyst with industry watcher Ovum. The novel domain of sports analytics is developed on various technological advancements– the network-attached commodity storage devices and multicore processors that have made it possible to predict data-intensive sports outcome. The development of Apache Hadoop distributed computing framework, MapReduce framework and high-performance NoSQL databases are responsible for attempting big data efforts in sports. “Tennis and Formula One racing represent the first generation of what might be possible with real-time data analysis. In those sports, the power of the analytics is concentrated on individual entities — cars or players. The problem becomes exponentially more difficult when you look at team sports, such as football, where there are 11 players on each side, each of whom can have an impact on the outcome.”- said Jeremy Shaw, business analyst consultant at IBM. Formula One racing team McLaren’s cars send a deluge of big data to the pit teams where the data is analysed in real time with the use SAP’s HANA in-memory technology. SAP HANA uses a data compression technology that allow McLaren to store the data inside RAM. Thus, the team can act upon the incoming data in real time to make any necessary race changing adjustments. 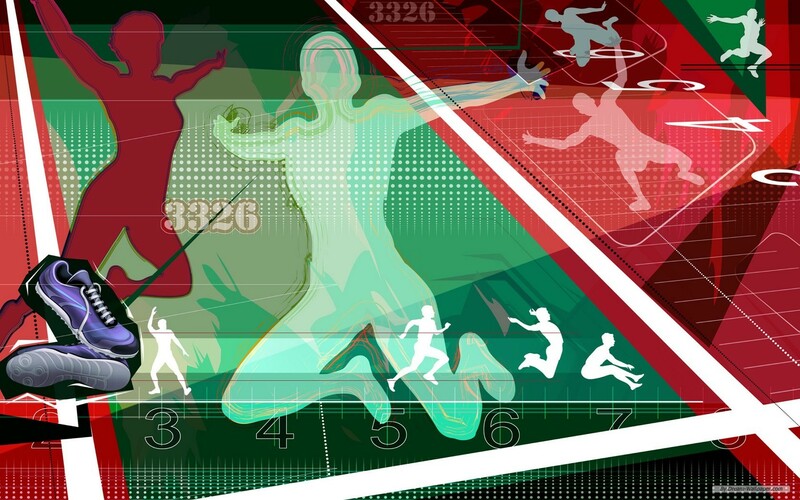 How big data and analytics are revolutionizing sports industry? Data analytics is helping players prepare in great detail for tough matches on the aspects of decision making, strategizing and morale boosting. Players are supported by the data science of analysing big data that helps them develop novel strategies for winning a game. Analytics helps in “extracting efficiency in every way possible” from the players. “What we can do in terms of analytics is immense. How players consume data before the game gives them an edge.Analytics is being widely used in cricket. Analytics helps in “extracting efficiency in every way possible” from the players.”- said Sriram Rajan, Executive Director, Analytics at IBM India/South Asia. 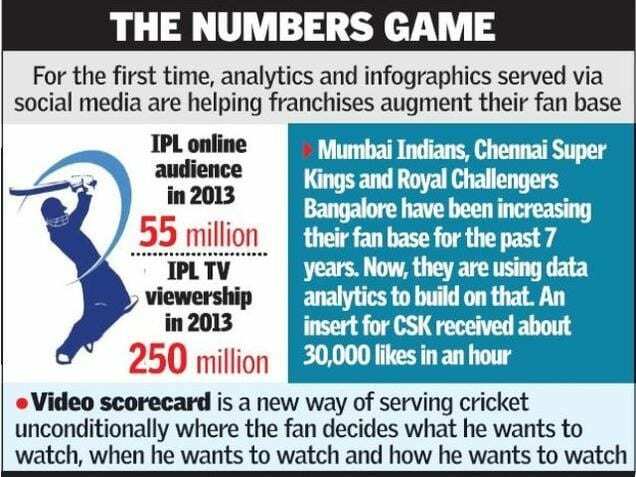 People don’t chase cricketanymore, it is cricket running behind the fans and players with big data. For instance, Australian bowlers often try to bully Indian batsmen.Aussies usually bowl to bully and intimidate and they are definitely not doing it just like that. Australian team has leveraged video analytics of multiple matches on multiple pitches. The winning probabilities of a team are based on previous historical records of who has won a match how many times in the same pitch with the same opposing team, the weather conditions, and crowd in the stadium, social media data, pitch and various other external data points. With the help of open source distributed computing frameworks like Hadoop, analysts can analyse zettabytes of historical data and crunch streams of online intelligence (Twitter, Facebook, LinkedIn, Instagram) to predict the possible outcomes of a match. 20th May, 2015, InformationWeek- SAP, NHL Score With Big Data during Stanley Cup Playoffs. The National Hockey League kicks off a five-year big data partnership with SAP with the 2015 Stanley Cup Bracket Challenge. Sports fans are generally experts of big data, though they might not be aware of thisfact. Sports fans gobble up statistical data when they weigh the possibilities of a playoff, a league title or a home team winning a game. NHL in collaboration with SAP has developed a match-up analysis with insights from SAP to help hockey fans find out which teams have an edge in the series.National Hockey League (NHL) has partnered with Samsung and SAP to provide Hockey fans an opportunity to build their own playoff brackets for predicting which team is likely to win the Stanley Cup. SportsMechanics, an Indian Sports Analytics is working with Chennai Super Kings, Royal Challengers and Mumbai Indians to enhance the engagement with fans through analytics. With the increasing interest and popularity of wearable fitness trackers and Google Glass, most of the technology vendors are trying to make the most of wearable technology with sports. miCoach, an Adidas system functions by having the players wear a device to their jerseys. The data collected from the wearable device helps team coach find out who top performing players are and which players actually need rest.miCoach system integrated with the wearable device also provides real time statistic information on the each player’s heart rate, acceleration and speed. These data points are put through analytics algorithms that help physicians and trainers plan for safer sports, better conditioning and training of the players. Data collected from Wearables plays a vital role in analytics as it keeps the teams and players healthy before and after a match. Most of the big sports stars think that sports injuries among athletes happen due to pure bad luck but it is not so. Big data plays a vital role in preventing injuries. Professional sports associations spend huge amount in treating injuries. The cost of treating injuries in Major League Baseball in 2014 was $1.4 billion and NBA spend close to $358 million dollars in 2014 for treating knee injuries alone. Analytics is also helping professional sports teams prevent sports injuries by analysing the data collected from wearable devices worn by players. The Seattle Sounders football team makes use of data points from heart rate monitors, pre-game fatigue and GPS trackers to predict the possibility of an injury. For instance, if a player on the field engages in increased number of high-intensity runs than average and is more tired, then there could be a possibility of a cramp or any other kind of muscle injury. Big data revolution is reshaping the outlook of sports throughout the world, however, the real action in sports will take place on the field. Big data analytics is playing a decisive role in sports but it cannot replace a sportsman’s instinct. It is just a matter of striking balance between leveraging big data analytics and experience of the sportsman on the field. Big data will just tell which sportsman is likely to make the right split-second decisions or which player will outperform in a match but it definitely cannot swing the ball for them. Big data will inform the sports industry to make informed big decisions, rather than dictate it.Big data analytics in sports will bring about higher standards of sportsmanship, skilled play on the field and render a more dynamic experience for the fans. Leveraging analytics the right way can become a gold mine for the sports industry but if not properly leveraged it can become a land mine. DeZyre is a platform where Industry professionals design and deliver courses on Big Data, Hadoop, Mobile App Development and Web Development.